Tuptalo, Dymytrii (Ростовський; Rostovsky) [Тупало, Димитрій] (secular name: Данило; Danylo), b December 1651 in Makariv, Kyiv region, d 8 November 1709 in Rostov, Russia. Saint, writer, theologian, and churchman. He studied at the Kyivan Mohyla Academy in 1662–5 and entered Saint Cyril's Monastery in Kyiv in 1668. 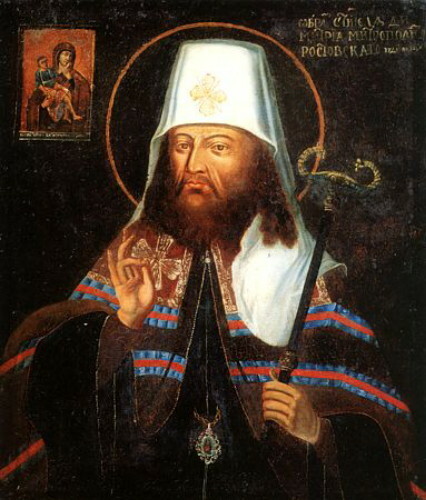 In 1675 he was ordained a hieromonk by Archbishop Lazar Baranovych. 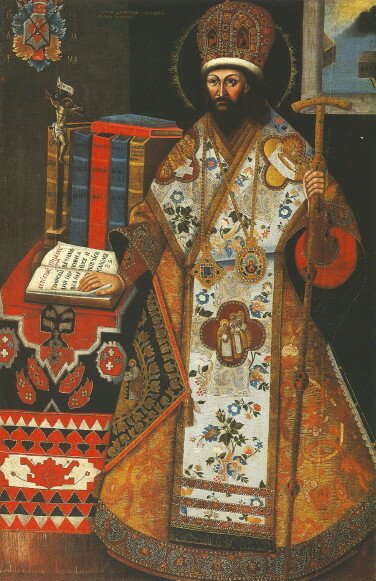 During the next 30 years he was hegumen of several Ukrainian monasteries (the Hustynia Trinity Monastery, Trinity–Saint Elijah's Monastery, the Yeletskyi Dormition Monastery, Saint Nicholas's Monastery in Baturyn, the Novodvirske Monastery in Volhynia, the Kyivan Cave Monastery) and Belarusian monasteries (Vilnius and Slutsk). In 1701 Tsar Peter I summoned him to Moscow, where he was consecrated metropolitan on 23 March 1701. He was assigned to the Tobolsk see but did not assume the post because of ill health. Instead, in 1702 he was sent to Rostov. 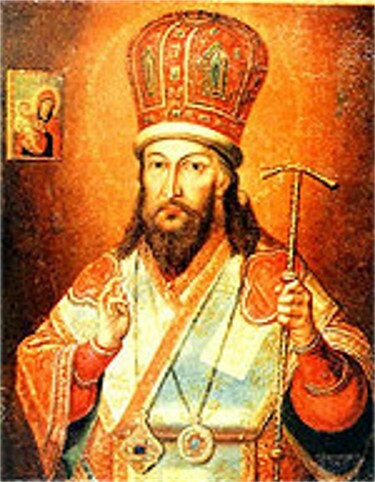 Tuptalo was associated with a group of Ukrainian hierarchs in the Russian church, led by Metropolitan Stefan Yavorsky, who fought against the Old Believers and other sects that had left the church over reforms introduced under Tsar Aleksei Mikhailovich. This group, however, did not accept the more radical changes favored by Peter, especially the subordination of the church to the state. 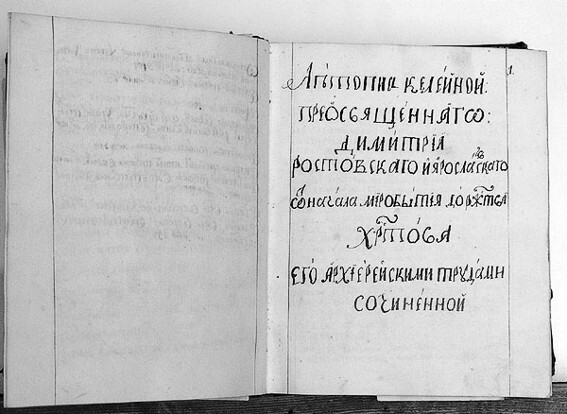 Tuptalo's first published work was Runo oroshennoie (The Bedewed Fleece, 1680; 7 edns by 1702), a collection of stories about miracles attributed to the icon of the Mother of God at the Chernihiv Trinity–Saint Elijah's Monastery. His most important work is his menaion for daily reading, a major collection of the lives of saints. It was first published by the Kyivan Cave Monastery in 1689–1705; at least 10 more editions followed in the 18th century. This collection is the best example of Ukrainian hagiography of the 17th and 18th centuries; it contains the lives of many early Ukrainian saints, based on various manuscripts and on adaptations from Greek and Latin sources. Tuptalo was a well-known orator, and a collection of his sermons (some of which criticized the reforms of Peter I), edited by A. Titov, appeared in 1909. He also wrote polemical attacks (see Polemical literature) on the schism (Rozysk o raskolnicheskoi brynskoi vere [An Examination of the Schismatic Brynian Sect, 1709]), theological treatises (Zertsalo pravoslavnogo ispovedaniia [The Mirror of the Orthodox Faith, 1805]), and historical studies (Letopis’ izhe vo sviatykh ... ot nachala mirobytiia do Rozhdestva Khristova [The Chronicle of Saints ... from the Beginning of Life on Earth to the Birth of Christ, 1784]). His literary works—including the spiritual dramas Komediia na den’ Rozhdestva Khristova (A Comedy on the Day of Christ's Birth) and Uspenie Bohorodytsi (The Dormition of the Mother of God)—were baroque in style and influenced by Western writing. The language Tuptalo used in his theological works was Old Church Slavonic, but it contained many Ukrainianisms. His sermons and menaion, which were intended for a popular audience, were close to the vernacular; posthumous editions of the menaion, however, were Russified by order of the Holy Synod.